Hi everyone! Today’s an exciting day because I’ve been helping Angela and Becca at Writers Helping Writers keep a BIG secret: what the next book in their thesaurus series will be. It might seem strange for an author to not tell their readers about the book they plan to release…unless your names are Becca and Angela. They are known for writing books on showing, not telling, and couldn’t pass up a chance to do just that by waiting for the cover reveal, which is today! The Emotion Thesaurus is one of my primary writing resources – well-thumbed in my quest to improve my characters’s emotional behaviour. Plus, this book is available for pre-order! You can find it on Amazon, Kobo, Apple Books (iTunes), and Indiebound. I’m off to pre-order my copy of The Emotion Thesaurus Second Edition now before I tackle another scene. 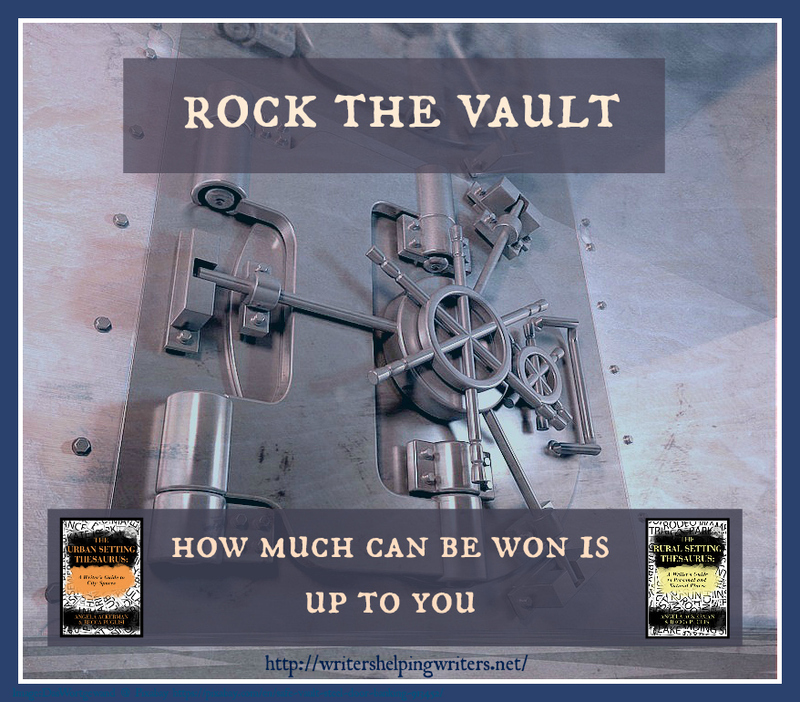 Writers, Have You Rocked The Vault? As this is there day, they have the comm, or the floor, here at Writing Wings. It is a writer’s job to draw readers into the fictional story so completely that they forget the real world. Our goal is to render them powerless, so despite the late hour, mountain of laundry, or workday ahead, they cannot give up the journey unfolding within the paper-crisp pages before them. Strong, compelling writing comes down to the right words, in the right order. Sounds easy, but as all writers know, it is anything BUT. So how do we create this storytelling magic? How can we weave description in such a way that the fictional landscape becomes authentic and real—a mirror of the reader’s world in all the ways that count most? In fact, swing by and check out this hidden entry from the Urban Setting Thesaurus: Police Car. 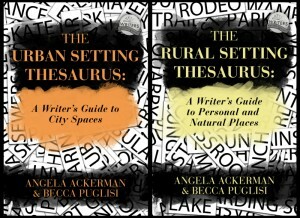 Tomorrow, June 13th, Becca Puglisi and Angela Ackerman are expanding their indispensable Thesaurus family by adding The Rural Setting Thesaurus: A Writer’s Guide to Natural and Personal Places and The Urban Setting Thesaurus: A Writer’s Guide to City Spaces. However, here is my review of The Urban Setting Thesaurus: A Writer’s Guide to City Spaces. As a writer, one of my most referred to books is The Emotion Thesaurus: A Writer’s Guide to Character Expression, so I was excited to find the Thesaurus family had new additions. I was not disappointed when I delved into The Urban Setting Thesaurus: A Writer’s Guide to City Spaces. The Thesaurus is well laid out, with three parts, starting with some insightful and useful sections that explain why setting is so important, and how writers can enhance their creations by using it well. Setting is too often the poor relation of characterization and plot, but, as Ackerman and Puglisi demonstrate, it can lift your writing. These eight sections include: The Setting as a Vehicle for Characterization; The Setting as a Vehicle for Delivering Backstory; The Crown Jewel of Settings: Sensory Details; and Common Setting Snags. These were informative, and made me aware of all the opportunities that I was missing in my own writing. The main body of the Thesaurus contains a collection of over 100 diverse settings arranged under helpful headings: IN THE CITY; RESTAURANTS; RETAIL STORES; SPORTS, ENTERTAINMENT AND ART VENUES; and TRANSPORTATION. There is plenty of options to choose from when finding the most suitable location – for instance I choice the settings ALLEY, BAR, RACETRACK, and POLICE CAR as the starting points for my exploration, and just these locations led down a multitude of avenues. Each setting contains a wealth of suggestions on the SIGHTS, inside and outside, although you definitely don’t need every one. These are just great prompts and reminders. Then you get the same on SOUNDS, SMELLS, TASTES, TEXTURES AND SENSATIONS. The suggestions don’t stop there. There are POSSIBLE SOURCES OF CONFLICT, PEOPLE COMMONLY FOUND HERE, SETTING NOTES AND TIPS, and another thought-provoking paragraph that demonstrates techniques – the SETTING DESCRIPTION EXAMPLE for each setting. For me, these EXAMPLEs demonstrated what was possible and the techniques available to a writer. Full marks to the authors for their well-crafter slices of fiction, that demonstrate what is possible with Settings. Perhaps the feature that got me dashing along other avenues most, was the RELATED SETTINGS THAT MAY TIE IN WITH THIS ONE. This lists those other settings, and in the eBook links to them. So POLICE CAR took me to the Police station. Prison, Courtroom etcetera. It was hard to stop exploring this Urban world. If that’s not enough, there are even related settings in The Rural Setting Thesaurus: A Writer’s Guide to Natural and Personal Places, so the two books work in tandem. The final part of the book contains tools to aid you in applying all these gems, as well as a list of all the Rural Settings, Recommended Reading, and more information on the first class team behind the Thesaurus family. After this wordy exploration of the invaluable Urban Setting Thesaurus, I’m off to buy The Rural Setting Thesaurus: A Writer’s Guide to Natural and Personal Places as its sister thesaurus is a tempting taster of what to expect. Both have to be an essential part of any fiction writer’s library. They will be part of mine.